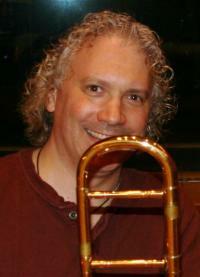 Over the last 20 years John Wheeler, Artist Associate in Trombone, Director of Small Jazz Ensemble, and Ensemble Coach for the Williams Jazz Ensemble has worked as a freelance Tenor/Bass Trombone player based in New York City. Work in the record, jingle, film, and television mediums, as well as performing live with some of the industries best known Grammy winning artists, has helped to prepare him for the role of Instructor and coach at Williams College. His recording credits include Maria Carey, George Benson, The Gypsy Kings, Janet Jackson, Luther Vandros, Patti Austin, BeBe Winans, Marc Cohen, Toni Braxton, Jody Watley, Terence Trent D’Arby, and Will Smith to name a few. John also played and worked on the HBO series “OZ”, as well as being featured on its theme. Film credits include Analyze That, 24 Hour Woman, Last Days of Disco, Bird, and Clifford’s Big Adventure. John also can be heard playing in the pits of Broadway, most recently on the hit musical Shrek. He has worked on several Broadway shows including Tarzan, Lennon, Fosse, Oklahoma, Kiss me Kate, Jekyl & Hyde and has played on over 30 national and international touring companies of various Broadway show productions. John has performed throughout the world with such legendary artists as; Aretha Franklin, Barry Manilow, Barry White and the Love Unlimited Orchestra, Bette Midler, Frank Sinatra Jr., John Tesh, Johnny Mathis, Joni Mitchell, Kansas, Kenny Rogers, Liza Minelli, Louie Bellson, Manhattan Transfer, Mel Torme, Natalie Cole, Ricky Martin, Roger Daltrey, Rosemary Clooney, Spinal Tap, The Funk Brothers, The Moody Blues, Tony Bennett, Wayne Newton, Yanni, Yes, and many others.